The news that Arctic sea ice is in meltdown is being treated as merely one news item among many, even though it threatens to set off a chain of tipping points affecting all of humanity and life on Earth. I’m reminded of how the iceberg warnings sent to the Titanic by other ships were interspersed with passenger messages, and the final and most urgent warning was not considered important enough to deliver to the captain. 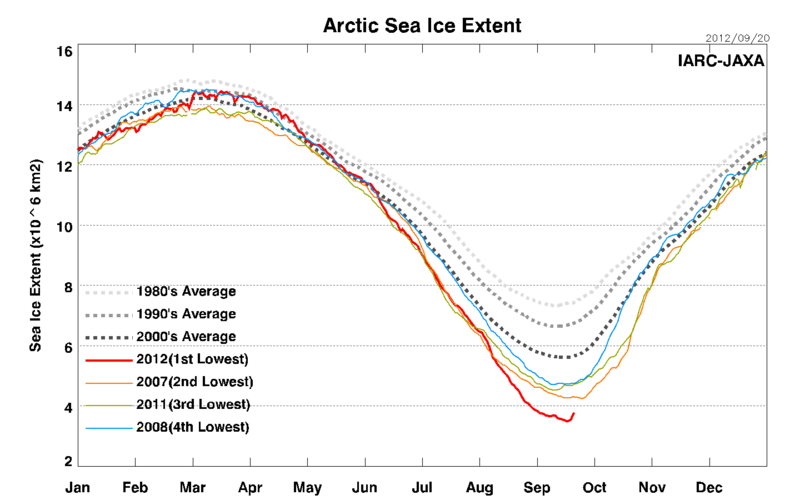 In 1912 it was the presence of Arctic ice that failed to sink in; in 2012 it is the absence thereof; but the lack of needed attention is the same. In reality there may be even less ice than satellite measurements show: in a location at 83°N where the satellites show 100% ice cover, field researchers found only 40% ice cover. The decline of multiyear ice has continued in 2012. 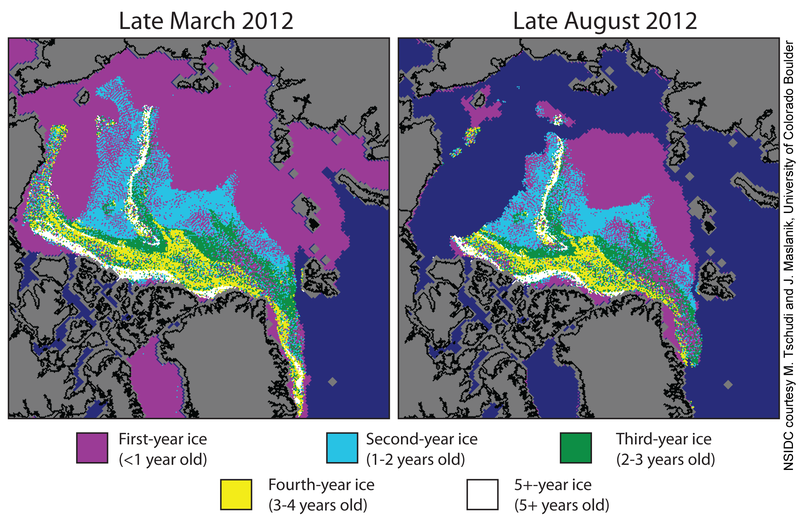 Of the five-year-old ice present in March, more than half of it had melted by August. The majority of the remaining ice is less than two years old. Remember, young ice is much thinner and easier to melt, so disappearance of old ice sets up even greater melting in future summers. 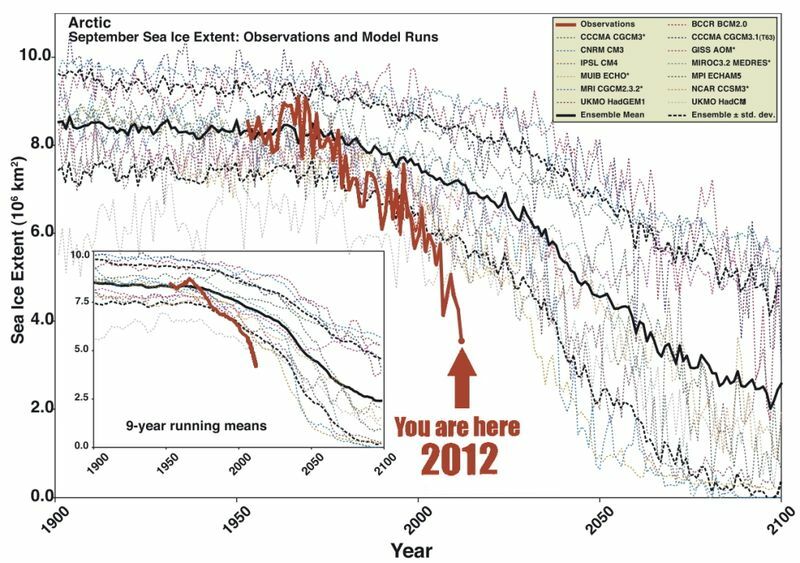 The 2012 melt suggests the ice is now thin enough that record melting can occur even in the absence of extreme weather. 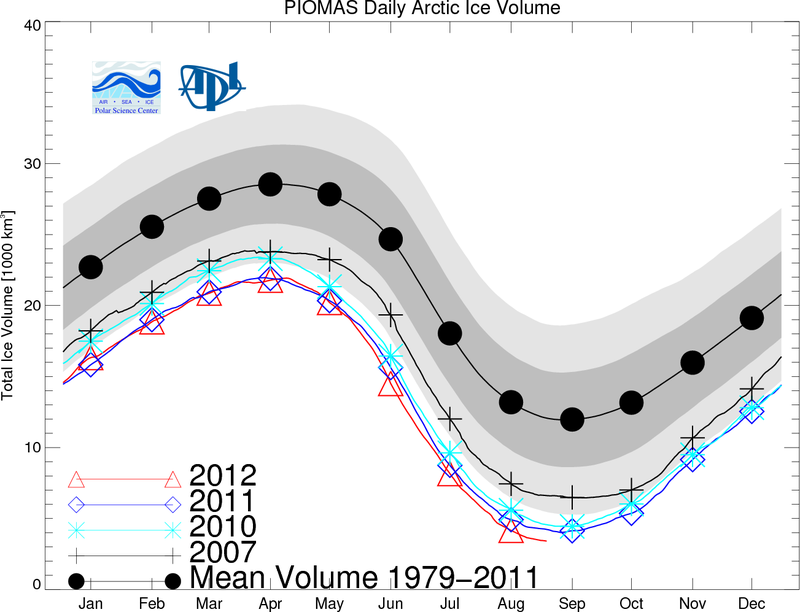 Sea ice volume data has not yet been updated to 16 September, but as of 3 September it had fallen to 3,400 cubic km, already below the record low set in 2011, and a mere fifth of what it was in 1979. It’s worth repeating: half the extent and four-fifths of the volume of Arctic summer sea ice is gone. Indeed, the 2012 volume is only about half of what it was in 2007, let alone three decades ago. Notice how close the red line is to zero. The loss of Arctic summer sea ice now looks inevitable and imminent, raising the question: is it already too late to prevent dangerous global warming? Losing Arctic sea ice would accelerate warming by the equivalent of 20 years’ worth of greenhouse gas emissions. We have less than 20 years of allowable emissions left. Worse, the Arctic Ocean is right next door to major tipping elements which could be triggered, like the Greenland ice sheet and carbon stored in permafrost (including permafrost submerged in the continental shelf). Oh, and Shell has already started drilling for oil in the Arctic Ocean. All this would move us far out of the benevolent range of global climates that have existed throughout the history of human civilization. The last time the global temperature was as warm as or warmer than today was the Eemian interglacial age 125,000 years ago. Then the poles were several degrees warmer, there was probably no summer sea ice in the Arctic, and multiple studies using different methodologies say sea level was 6-9 meters higher (meaning at least partial melting of the Greenland and/or West Antarctic ice sheets). As NASA climatologist James Hansen puts it, the Arctic melt is “a planetary emergency”. Humanity urgently, urgently, urgently needs to cut CO2 emissions to zero or near-zero (and eventually less than zero) before global warming spirals out of our control. We also need to start considering geoengineering measures. 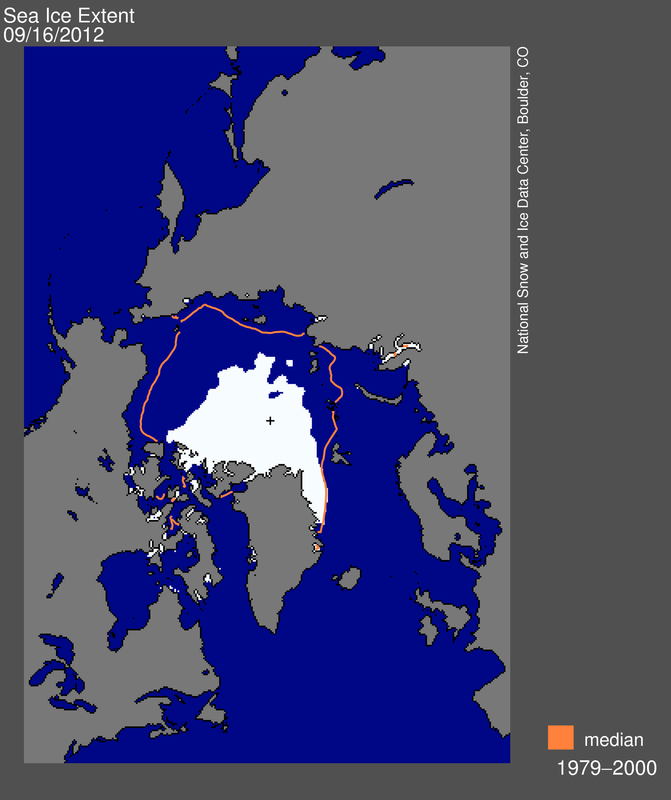 The situation in the Arctic suggests we may already be out of time. If you get your news from watching the ABC TV News (in Melbourne) then the day that the arctic minimum was reported in the news the lead story on the TV news was about a possibly corrupt jockey and the next story was the funeral for a silly footballer. 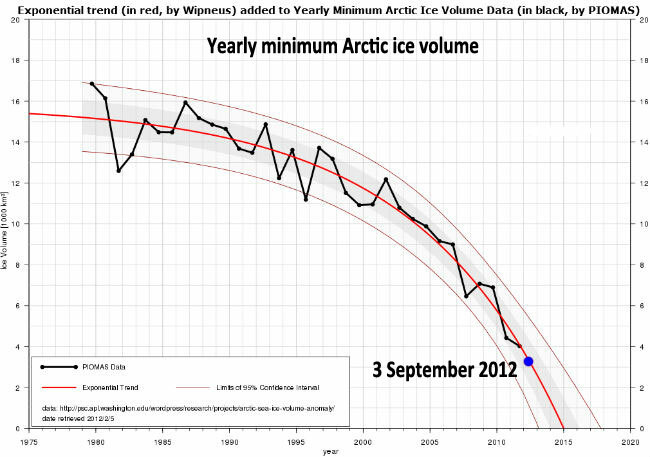 The arctic minimum was not reported.